Collectively the global palm oil market’s value is projected to expand continually from US$ 65.7 billion up to US$ 92.8 billion by the year 2021. Given the commodity’s versatile nature, palm oil has rapidly become the world’s most widely used vegetable oil, found in a vast range of products from confectionaries and baked goods to cereals, washing powders, cosmetics and even as a first-generation bio fuel. However, parallel to the global rise in demand for palm oil there has also been increasing concern as to the environmental impact of its cultivation. At present, Indonesia is the world’s largest producer of palm oil while Indonesia is the largest exporter, however as awareness on the environmentally unsound practices followed in those nations, smaller nations like Sri Lanka have an unprecedented opportunity to offer a valuable alternative to international markets in the form of sustainably cultivated oil palm. Indeed, at the outset, it must therefore be acknowledged that just like any other crop, oil palm too can be cultivated in a manner which is environmentally, and ultimately economically unsustainable. One need not look further than the shrinking forests and disappearing habitats of Borneo in Indonesia to see such practices at their worst, following a series of severe forest fires sparked by ‘slash and burn’ techniques of clearing prevalent in parts of Indonesia. However, it is equally important to emphasize that, it is well within our reach to cultivate oil palm in an ethical, socially, and environmentally sustainable manner also, provided that sufficient efforts and investment is directed towards sound, sustainable, integrated agronomic practices. If the right techniques are adopted, oil palm cultivation can actually make substantial positive contributions to the environment, while serving to advance socioeconomic development on a scale never before witnessed in Sri Lanka. It is therefore absolutely vital that we totally avoid the destructive path taken in the Indonesian oil palm industry, and we are pleased to note that Sri Lankan plantations are committed to the implementation of such sustainable practices. Over the recent past, Sri Lanka has made important progress towards diversification in invaluable cash crop, spearheaded by the country’s regional plantation companies (RPCs), and in alignment with the Government’s stated aim of cultivating 20,000 hectares of oil palm. From the perspective of the domestic economy, the reasons for this diversification are undeniable. In 2015, Sri Lanka’s annual edible oil requirement stood at 160,000 Metric Tonnes (MT). Conversely, the country produces a total of just 53,000 MT of coconut oil and 18,000 MT of palm oil, leaving a deficit of 89,000 MT in the island’s edible oil requirement,. Notably, this data actually excludes all other vegetable and plant based oils, meaning that the country’s actual total requirement is even higher. While these dynamics present notable challenges to the Sri Lankan economy, particularly in terms of the depletion of foreign exchange, they also speak to vast untapped potential for import substitution and export development. In 2015, Sri Lanka spent Rs. 20.8 billion on oil and fats imports with a significant majority of those imports being for palm oil. Collectively, palm kernel, palm olein, palm stearin and crude palm oil accounted for 164,835 MT or nearly 30 of all edible oil and fats imported into Sri Lanka. Hence from purely a demand perspective, we can clearly see that there exists a clear, strong, pressing demand for oil palm, both locally and internationally. Similarly, the supply-side economics of oil palm are equally persuasive. While it is fairly common knowledge that palm oil is a vital, highly in-demand commodity in international markets, the efficiency of this crop tends to be less well understood. Particularly when juxtaposed with other popular vegetable oils, this picture comes into sharper focus. Soya bean oil, the closest competitor to palm oil, accounts for approximately 29.8 percent of total vegetable oil production however, as a crop, soya bean requires the largest land area – approximately 103.8 million hectares of cultivated land or approximately 58.4 percent of the global land extent under vegetable oil crops, in order to produce 41.8 million MT annually. canola accounts for 24.4 million MT produced from 33.3 million hectares or 18.7 percent of the global land extent under oil crops while sunflower oil accounts for 14.6 percent of such land, but produces 10.5 percent or 14.8 million MT per annum. In comparison, oil palm far outstrips any of its competitors, producing 59.4 million MT or 42.3 percent of the total global requirement for vegetable oil – using just 14.8 million hectares of land which is just 8.3 percent of all land across the globe used for cultivating crops for vegetable oil. This phenomenal efficiency is a hallmark of the oil palm crop. When compared with Sri Lanka’s mainstay of plantation crops, oil palm has easily the lowest Cost of Production (COP) at just Rs. 15 per kilogram of Fresh Fruit Bunches (FFB), with a net sale average (NSA) of Rs. 45 per kg of same. By comparison Rubber commands a NSA of approximately Rs. 300 per kg, but is hampered by a substantially lower margin given the rubber COP is also close to Rs. 300 per kg. This dynamic is further escalated when oil palm is compared with tea which has a NSA of Rs. 550 per kg but also accounts for the highest COP – both of Sri Lankan plantation crops as well as when compared with tea productions in competing countries – at Rs. 520 per kg. The fact that the average land productivity for tea and rubber in the regional plantation companies is only around 1,500 and 1,000 kg per hectare per annum respectively, also contributes to relatively low returns from these crops. The superior potential of oil palm to reinvigorate the Sri Lankan plantation sector is undeniable. Growth in demand for palm oil in the world even surpasses that of tea and rubber. Unlike tea or rubber, palm oil is cheaper to produce and requires far less land, and far less investment. The only other close competitor for vegetable oil in Sri Lanka, coconut has a NSA and a COP of Rs. 40 and Rs.15 per nut respectively. However, coconut produces a yield per hectare (YPH) of only 7,000 nuts, whilst oil palm produces 18,000 kg per hectare annum. In essence, oil palm is by far Sri Lanka’s most profitable crop. Coconut generates Rs. 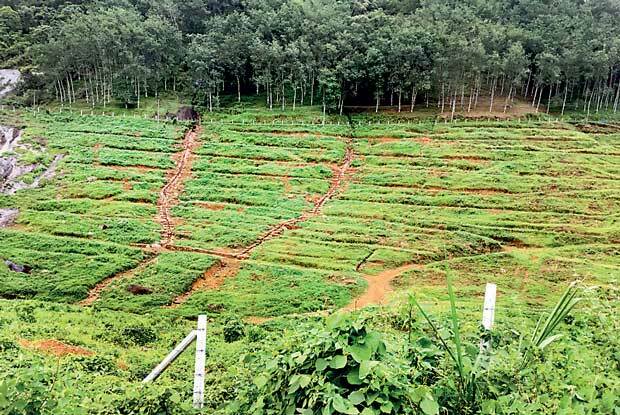 175,000 per hectare per annum, while Tea and Rubber produce Rs. 45,000 and Rs. 50,000 respectively whereas oil palm generates Rs. 514,000 per hectare per annum. Given the stark differences in the profit making potential of these crops, the only remaining question for the Sri Lankan plantation industry is whether we have the ability to establish and manage oil palm in a manner that is sustainable for all stakeholders and for the environment as a whole. The health of the plantation economy is intrinsically and irrevocably linked to the health of the plantation environment. When dealing with the reality of the plantation sector, we must first understand that the financial viability of investments into the estates hinges on the ability of such investments to generate returns sufficient for them to be sustainable. If we continue to confine ourselves solely to crops which have low margins, then investments will eventually begin to decline. No new investments mean no employment, and an inability to implement agricultural best practices. Therefore in a very real sense, low profitability can lead to environmental threats over time. Crop diversification is also a widely accepted strategy for sustaining financial viability in plantations as it protects investors from unhealthy price fluctuations of plantation produce. If we are to move into oil palm in a concerted and systematic manner, we need to guarantee the ability of these enterprises to not just continue, but drastically scale up their investments across the entire plantation sector. This is the most simple and holistically beneficial solution for all stakeholders to the plantation industry. Unfortunately, RPCs face serious obstacles in leading the industry towards this prosperous future. The majority of these obstacles stem for myths as to the environmental impact of oil palm cultivation, some of which have basis in fact, others completely in fiction, but all of which can be effectively mitigated against. Having worked extensively in this area through the Wayamba University of Sri Lanka, I have had the opportunity to participate in active discussions with various stakeholder groups who have repeatedly raised the same concerns about oil palm. Among the most common concerns raised is that oil palm cultivation severely depletes water resources in the surrounding area while its thick canopy prevents undergrowth from taking root, negatively impacting the soil and the diversity of flora and fauna. Certainly with the type of ‘slash and burn’ cultivation of virgin forest that takes place in Indonesia, this is the case and we must all oppose such practices, but the situation in Sri Lanka is completely different. Sri Lankan RPCs are bound to strictly adhere to rigidly enforced legal prohibitions on the clearing of existing natural forests. In that regard, all Sri Lankan RPCs are only able to plant oil palm on existing plantation land. To date, RPCs have only replaced unproductive rubber and tea in low lying regions of the country with oil palm, all of which is situated in Sri Lanka’s wet zone. With such diversifications RPCs need to endeavor to maintain production levels of both tea and rubber crops by enhancing land productivity of the remaining younger cultivations for which there is ample room. With regards to water uptake, it is certainly true that each oil palm plant consumes more water. A typical mature oil palm plant requires 249 litres of water per plant, where coconut requires 130 litres and rubber consumes 63 liters. However, the requirement per plant must also be balanced against the fact that oil palm requires a significantly smaller number of plants per hectare than coconut, rubber or tea. To get a true picture of the consumption of water resources, we must therefore analyze these crops in terms of daily water requirement per hectare. Coconut requires 20,800 liters per hectare per day while rubber requires 31,500 liters and oil palm, slightly more with 34,860 liters per hectare per day. Given that oil palm is only cultivated in regions where annual rainfall averages 3,500 mm, and that the crop water requirement is around 1,300 mm per annum which is 37% of annual rainfall of oil palm cultivating areas, as compared 1,095 mm per annum for the rubber crop, there is no situation in which oil palm cultivation can lead to a deficit in water resources. In fact, while oil palm consumes more, it also contributes more to the water cycle as well, meaning that there is no real net change in water availability. Further, under water limiting conditions, caused either through long dry spells in wetter regions or by cultivating in drier regions, as for all other crops, oil palm also has the ability to regulate and lower crop water use leading to a decline in productivity. Oil palm and coconut have shallow and fibrous root systems and hence would sense soil water deficits and would also regulate their water use much quicker than crops possessing deep tap root systems. When speaking of the environmental services performed by oil palm, it is therefore important to note that with regards to the fixing of atmospheric carbon-dioxide (CO₂), oil palm has a far greater capacity for absorbing carbon-dioxide from the air. As with the increased water consumption, there is an underlying cause for this, and that is the accelerated and higher productivity of an oil palm plant. 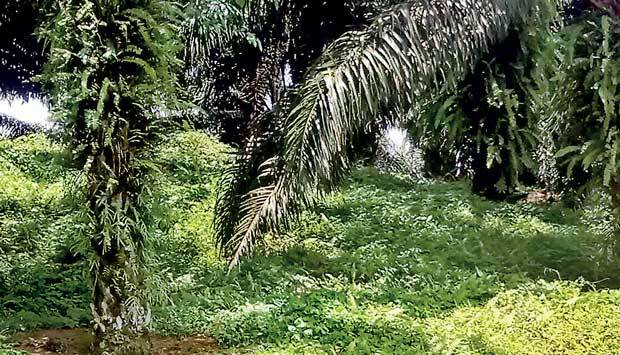 Similarly, the myth that oil palm causes an absence of undergrowth is one which is easily dismissed, and a visit to any estate that employs basic agronomic techniques will prove the reality of this fact. 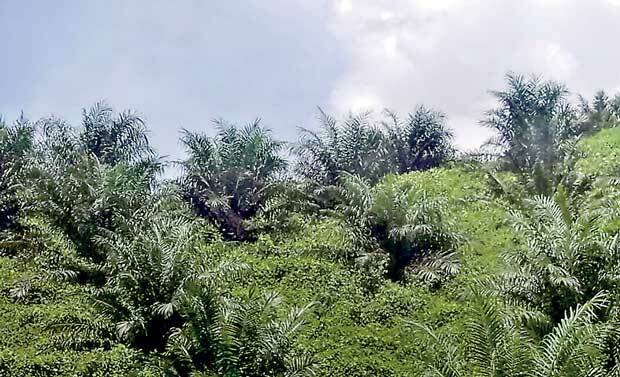 When approaching this issue from a factual basis, it therefore becomes clear oil palm can easily be cultivated without depleting water resources or negatively impacting environmental habitats, simply through the adoption of proper land selection, planting, soil and moisture conservation practices. Given the substantial and rapid returns that oil palm is capable of generating those who plant would quickly recover their investments into proper agronomic practices. This in turn would only enhance the value of oil palm produced in Sri Lanka. As with any crop however, we must take care, and employ careful planning and agricultural best practices when establishing a commercial scale plantation. In that regard, I would propose a few basic guidelines to ensuring that Sri Lanka’s oil palm plantations stay sustainable as they grow. We must ensure that all oil palm plantations are established only in areas with average rainfall greater than 3,000 mm and at an elevation below 300 meters. They should not be established on steep slopes, hence terrain with a slope of above 22 degrees or 40 percent must be avoided. Similarly, RPCs must continue to avoid planting in catchment areas and in natural forests – a factor which is undoubtedly likely to continue given that RPCs are confined to existing plantation lands. They must seek to replace crops with diversifications into oil palm where those crops have reached the end of their natural economic lifespan. Meanwhile, certain agricultural practices must become mandatory such as the establishment of ground cover, contour planting, correct stand per hectare, draining and terracing and; this will drastically improve soil and moisture conservation. Provided these basic guidelines are followed, I see no reason Sri Lanka cannot embark upon a systematic, sustainable diversification into oil palm as part of a wider, winning strategy to secure the future of the entire plantation sector.